Carlie Rosbotham (16) from Friends' School, Lisburn is announced as the first ever SPAR Star of The Music Box: Home for Christmas. Peter Corry from PC Productions and Bronagh Luke, from Henderson Group owners of the SPAR franchise in Northern Ireland and sponsors of this year's series of shows, selected Carlie as the winner of the competition to sing on stage at the Belfast Waterfront from 18th ' 20th December. 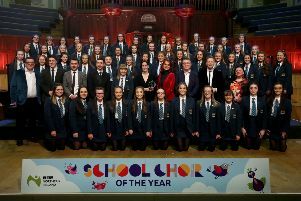 A fifth year pupil from Friends’ School, Lisburn has won the chance to sing on stage with some of Northern Ireland’s finest talent. Carlie Rosbotham has been named the first ever ‘Spar Star’, after she won a competition to find a soloist for the hugely popular Christmas show The Music Box that returns to the Belfast Waterfront this year with a brand new production, Home for Christmas. The talented 16-year-old will sing on stage during four shows from December 18 to 20, taking the audience on a magical journey through a selection box of festive musical gems. Producer Peter Corry said: “Carlie is such a talented girl and her voice is a delight to listen to. Carlie almost didn’t even enter the competition, but after encouragement from her family, she took the plunge: “I wasn’t going to enter. I’m a huge fan of Peter Corry and have been to The Music Box Christmas shows before, but I just didn’t think I would stand a chance. “Luckily, my Dad and my whole family encouraged me to enter after hearing the competition on Citybeat, so I submitted my video audition and couldn’t believe I got a call back. Then, during the live auditions I just sang my heart out. I was returning home from a school trip in France when I got the call to say I’d won, we all screamed the airport down. The Music Box – Home for Christmas will hit the stage at the Belfast Waterfront from Thursday 18 December until Saturday 20 December, including a matinee performance on the Saturday. Tickets for The Music Box – Home for Christmas are available from the Waterfront Hall box office on 028 9033 4455.